Daikon and abura-age (fried tofu pouch) always make a nice flavor combination. I like them together in miso soup ever since I was little. They are good together in the donabe rice, too! 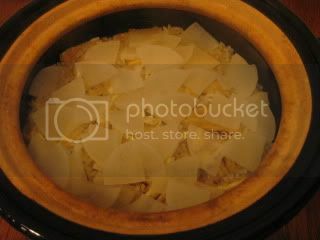 So, I made a simple daikon & abura-age rice dish with the double-lid donabe rice cooker, "Kamado-san". The recipe is very simple. To cook the rice, I combined 2 rice cups (360 ml) short grain rice with 300 ml dashi stock, 2 tablespoons each sake and light color soy sauce ("usukuchi shoyu"), and a pinch of salt in the donabe (soak for 20 minutes). The mixture was topped with some thinly sliced blanched abura-age (fried tofu pouch) and about 1/2 cup of daikon slices. After the donabe was covered with both lids, the mix rice was cooked over medium+ heat stove top for 15 minutes, then rested for 20 minutes after turning off the heat. 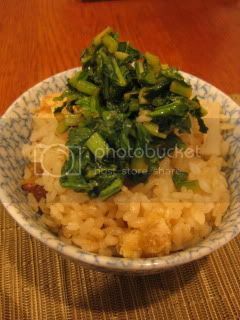 I served the rice with sauteed chopped kabu (turnip) leaves. The dish was so elegantly delicious. 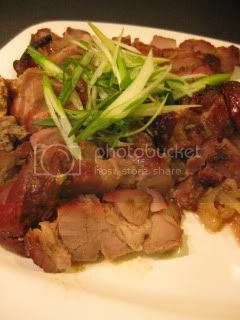 I also enjoyed oven-baked cha-shiu pork (you can find the recipe here) with the rice.